Q What Should I Use? 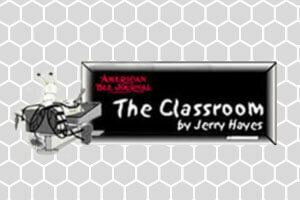 I am following your instruction given in the Classroom to the letter Jerry. I have memorized the three words about honey bee health you gave us: varroa, varroa, varroa. I have also memorized the “Tools for Varroa Management Guide” from the HBHC and as summer progresses I am sampling and getting ready to treat when varroa gets at or above 5 mites per 100 bees. The Guide gives treatment options for use to control varroa. What do you think I should use??? The large honey bee colonies we manage are varroa nurseries. Varroa requires lots of ‘brood’ to be able to reproduce and increase their ability to survive and pass on their survivor genetics to future generations. A colony of our European genetically based honey bees may have 30,000-50,000 individuals in it at the height of the season. That is a lot. That is a lot of reproductive potential for varroa mites and the viruses they vector to reproduce in honey bees as well. Refuse to control varroa and the colony will weaken and die on its own in 18 months or so. Fail to appropriately sample, control and sample again and again, all the while selecting a varroa miticide that is as safe as possible for the colony and also effective in killing, hurting, damaging varroa mites when they rise above treatment thresholds means that that colony is stressed and may die over the harshest season….winter. There is a fine line here and nobody at any level of beekeeping is perfect at this. Killing a small bug (varroa) on a big bug (honey bee) is simply super hard to do without either under controlling the small bug or hurting the big bug with the pesticides used. Then think of this small, closed off, isolated area we call a beehive that contains a chemical sponge called beeswax comb. It has been said that beekeepers use more pesticides per sq.ft. than anybody else in agriculture, lawn care, or home insect control. So, our beekeeper goal is to control varroa mites as safely and efficiently as possible, which requires accurate information and access to that information. There is a research article titled, “Toxicity of Selected Acaricides to Honey Bees (Apis mellifera) and Varroa (Varroa destructor Anderson and Trueman) and Their Use in Controlling Varroa within Honey Bee Colonies”. It was published in “Insects 2018”. It is easily googled up. Below is Figure 4 found on page 7 of the above paper that shows in this study what varroa treatments were trialed, the dosage, at what level they control varroa and AND how toxic they were to the honey bees—what I find the most interesting part. Without offering my opinion it looks like the thymol (essential oil) product ApiGuard killed less honey bees and did a good job at controlling Varroa mites. Others control varroa somewhat better, but kill slightly more bees. This is great tool to use to select varroa treatments. Some of my supers have molded. Is there a way to save them? They are really good frames. Happens at times Kay. Keeping honey bees healthy and successful is a numbers game…more bees are better than less bees. And at most times of the year that means a bee on every square inch of comb. Honey bees are very hygienic and will clean up those sticky, icky spots very quickly as it is primarily a comb surface issue. Kind of like when you are cleaning up your sticky counter top in your kitchen after preparing an amazing meal. Place the super(s) on a colony that has a full population and it will be cleaned up and sparkling in several hours. If you want to take it to another level to make yourself feel better spray a weak household chlorine bleach solution on the comb. This will deactivate the mold. Place comb outside in sun for a few days to dry and air out. Then place the comb in a super on a colony with lots of bees and it will be cleaned up overnight. Q What Is This Blooming! Just wondering if you can help me out in identifying this bush/tree. See attached pics. I just realized this year that all this brush in the powerline right-of-way’s etc. actually blooms. So, being a beekeeper, I can’t stand not knowing what plant it is, if it’s attractive to honey bees, etc. It looks to me like Autumn Olive, Elaeagus umbelkata. It is classified as an invasive shrub that is beautiful and fragrant and a great early nectar and pollen source for ‘bees’. But as an invasive it can outcompete some native plants which isn’t good either. Enjoy it until somebody tells the power company to kill it. I look forward each month to receiving my monthly issue of ABJ. Since I am retired, I usually drop everything and read the issue from cover-to-cover, even the articles I don’t think will have any new interesting information. Sometimes I get fooled. Anyway, yours is one of the first articles I always read. You do a great job in responding and answering everyone’s questions and giving advice to their situations. Here in McDowell County of Western North Carolina we have a dynamic honey bee club (McDowell Honeybees) that puts on a free 3 day beginner bee school each year at the local community college. As a follow-up to this I am developing an advanced 3 day bee school to promote sustainable beekeeping and especially help ….